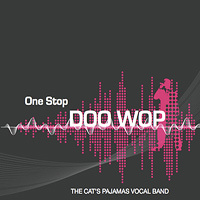 The Cat's Pajamas - vocal band Demo. . .check me-owt! 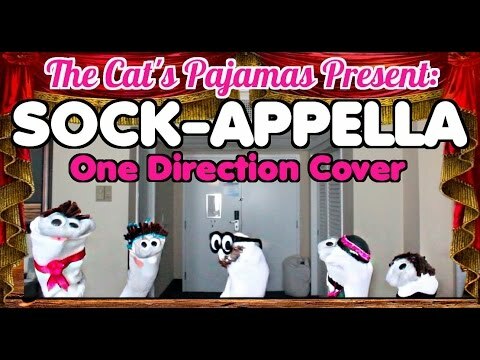 The members of The Cat's Pajamas - vocal band perform One Direction's "You Don't Know You're Beautiful". . . with socks! It's time to Rock out with your Sock out! Get off your feet and drop the beat. . . they got 99 problems but a pitch ain't one! They but the "tube" (sock) in YouTube. And all the girls say they're pretty fly for a wiggely eye. Lady Gaga's "Born This Way," Leonard Bernstein's "Tonight, Tonight," "Stars & Stripes Forever" and a nice nod to the Sweeps closing Doo Wop anthem "Goodnight Sweetheart." Co-founder Brian Skinner's "Beat Bass" is tight and hot, and the harmonic hits just keep on comin'! Don't miss this rockin', big fun collection! Pride of Branson, MO, 5-man a cappella band Cat's Pajamas has been sharpening their live show since 2005, and it shows bigtime! These 13 songs are pure entertainment, from soul hits like James Brown's "I Feel Good," pop hits like Del Shannon's "Run Around Sue," "Love Potion Number 9" and "Earth Angel;" Roy Orbison's "Pretty Woman" and the Drifters' "Up On The Roof;" Doo-Wop classics like "Stand By Me" and "Blue Moon;" and even a sweet reggae medley of "Kiss the Girl" and Van Morrison's "Brown Eyed Girl"-these are great covers and fun stuff. Enjoy! 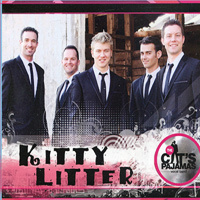 All male a cappella quintet Cat's Pajamas of Branson, MO first got together in 2005 to sing live in an Oreo cookie jingle contest, placed in the top 10 and never looked back. 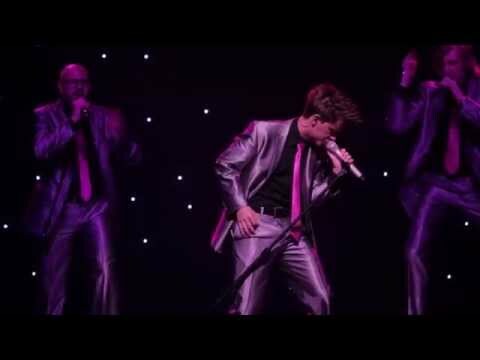 They've been touring extensively and recording, sharpening their vocal chops and live show, which we get a nice taste of on "One Stop Doo-Wop"-ten of the 12 cuts were recorded live in the Majestic Theater in Madison, WI, and "I Feel Good" was recorded in group member Nate Mendl's dining room! Favorites are "OREO/Rockin' Robin," when we get to hear the famous Oreo song that brought the group together, "Duke of Earl," CCR's "Proud Mary," the bubblegum hit "Hooked on a Feelin'," the Drifters' "Under the Boardwalk," "Up On The Roof," The Righteous Bros.' "You've Lost That Lovin' Feelin'" and "Only You." The live audience went nuts over this one, and if you love Doo-Wop, we bet you will too! Brian, Nate, Brad, Nathaniel, Mike and Nate are five-man a cappella band from Branson, MO who entered the national spotlight in 2005 when they placed in the top 10 while performing their Oreo Cookie Jingle for Randy Jackson. Since then they have been touring the world, and now perform over 200 shows per year in Branson and throughout the U.S. They have been seen on multiple TV shows, cruise ships and performing arts centers around the world, and were recently picked to compete on NBC's The Sing-Off! 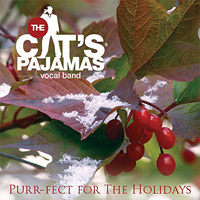 "Purrfect..." is the group's first Christmas CD of 12 tunes. Favorites are a crazed, manic, very fun "You're a Mean One, Mr. Grinch," a very silly "The Chipmunk Song" with perfect imitations of Alvin, Simon and Theodore; a jazzy, chord-bending, very Motown arrangement of "Silver Bells;" a mellow "White Christmas, Part 1 and jazzy, finger-popping, doo-woppy "White Christmas, Part 2; a powerful, sweet take on "Mary Did You Know," "Mustang Santa" is a big fun, soulful romp, and, after that, the incongruous but hauntingly lovely "In the Bleak Mid Winter" features guest tenor George Dyer. 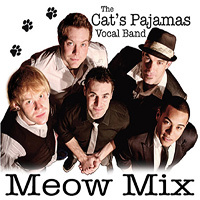 We love a cappella groups who become great entertainers, and Cat's Pajamas is one of the best. Don't miss this one! 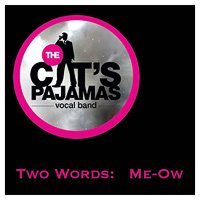 "Two Words: Me-Ow" is a live, "best-of" album by 5-man Branson, MO a cappella quintet Cat's Pajamas, recorded at the Majestic Theater in Madison, WI. The Cats have been singing and touring extensively together since 2005, and they know a lot about blowing away an audience with great stuff, wonderful arrangements, sweet leads and harmonies! There are 13 winners here, "Some Kind of Wonderful," "Drift Away/Drops of Jupiter" medley, the Motown hit "Ain't Too Proud to Beg," the country/pop hit "Walking in Memphis," the Steve Miller Band's "The Joker" (which segues into "Angel of the Morning" and some Reggae samples), "Radio/Video Medley," "Galileo," "Meet Virginia," "Classic Rock Medley" and "Mustang Sally." For pure entertainment, we can tell you from our almost 30 years of loving it at the Harmony Sweeps Regionals and Finals, that nothing beats live a cappella, and we offer Cat's Pajamas and their excited audience in Madison as living proof!